Man is a mystery. Although his physical action can be read but the motion of the soul is unpredictable where it leads. Within humans contained possibilities that are endless. If a human is being compared to universe, the human self is like a small cosmos and the universe is a big cosmos. Remarkably, the big cosmos can be stored in a small cosmos. The human mind itself, if it is compacted and summarized can be smaller than a grain of sand. And when it is deployed can be wider than the universe. Yes, man is a great mystery, for himself or for others. Higi Jung tried to interpret the figure of Frida Kahlo with the sharpness point of view that is left loose. Excerpts meaning embodied in the works of photography. Her artistic presentation technique is unique. She presents a psychological analysis as an expression of short poems. 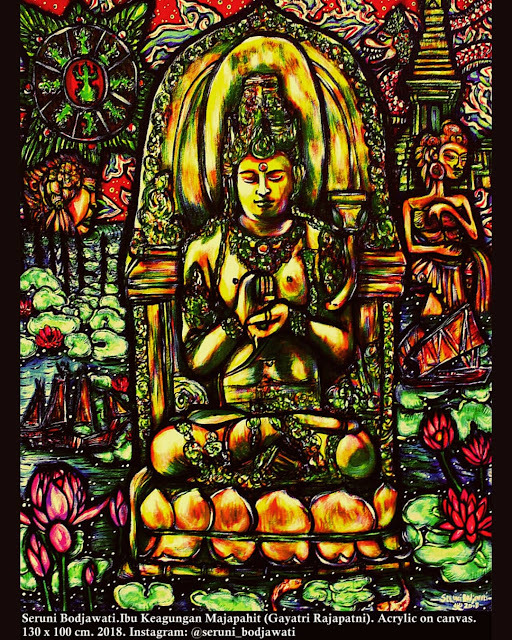 It is fresh with surprises that are igniting enlightenment. The shortness of expression precisely impresses the longevity of distraction power in creativity that is difficult to be measured. Frida’s existence as a source of inspiration is described as eternal riddle. Man is a big question mark. His imperfection becomes the falsification of his wholeness. The secret of the noise is located on the edge of silence. The maturity is within the simplicity reflexion. Photographic works of Higi Jung become an unexpected appeal precisely because its expression is very close to everyday reality. Similar wonders to the heartbeat. It is fused in the body until it has palpable presence. Higi Jung was born in Uncheon, Kunggi-do, on December 5, 1986. She ever stayed in Moscow, Russia, in 1991-1993. Until now she is living in Seoul, South Korea. In 2009 she graduated from Chung-Ang University in creative writing and photography. Getting to know Frida Kahlo at the age of 17 through the film titled Frida. Her curiosity with the Mexican legend was made her continuously hunting information via internet and books. Finally, the figure of Frida is used as a source of ideas for work, especially in photography. 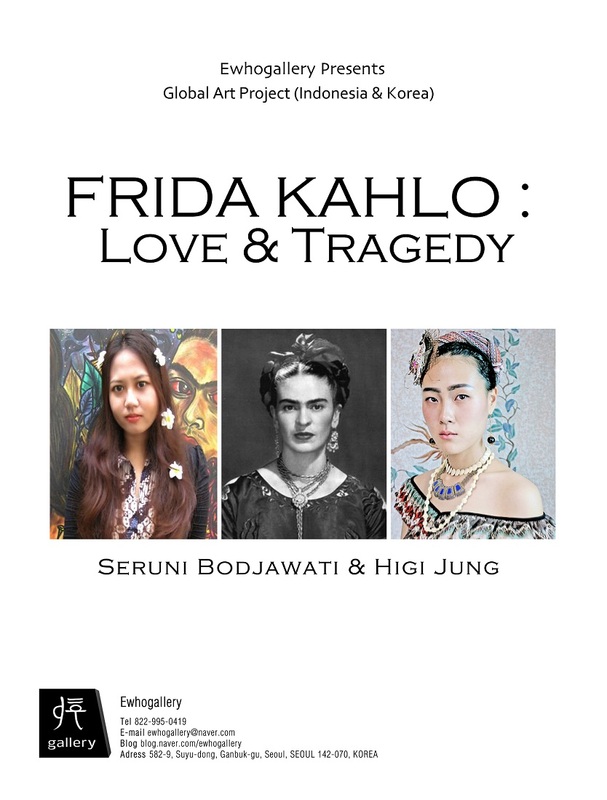 Equally fascinated by Frida Kahlo, I agreed to collaborate with Higi Jung in the project Frida Kahlo: Love & Tragedy, supported by Ewho Gallery, Seoul, South Korea. Since high school, starting when I was 15 years old, I have created dozens of paintings with the main object of Frida Kahlo figure. Working together with Higi Jung would certainly be an important record for both our artistic journeys. There are seven pieces of my paintings I created in this art project. Five pieces sized 200 x 145 cm; A Couple of Rebels, Glimpses of Morning Star, Children of Heaven, The Legend Vanished in Memories and The Silent World of Frida. Two others are Conquering the World sized 200 x 300 cm and Opera Pablo Pickahlo sized 250 x 200 cm. The media of all my artworks are acrylic on canvases. My inclination is to tell by the winged language. I see the figure of Frida Kahlo in my artworks as an existence plagued with gloom fate. Full of problems, rebelling to grey fate, continuously searching for herself holding a twist of death on her back. As human with multidimensional characters, the figure is hammered with a big question mark that will never go over answered. I also idealize it by intentionally increasing the volume of humanity. In order for the dramatic aspects that were created can be sticking sharper. Decorative technique is quite dominating the whole field of the canvases. Surrealistic atmosphere is spreading in the stern expression. The power of colours is slightly muted to strengthen the suggestive power and fantasy games. By featuring the clarity of mind, Higi Jung created eight photographic works. Two of them are self-portraits. Four of them were shot with a model of South Korean actress, Jaehwa Kim, her own cousin. And two works were shot with a model of a Javanese woman, Darajati Pertiwi. She shot the six works in South Korea. 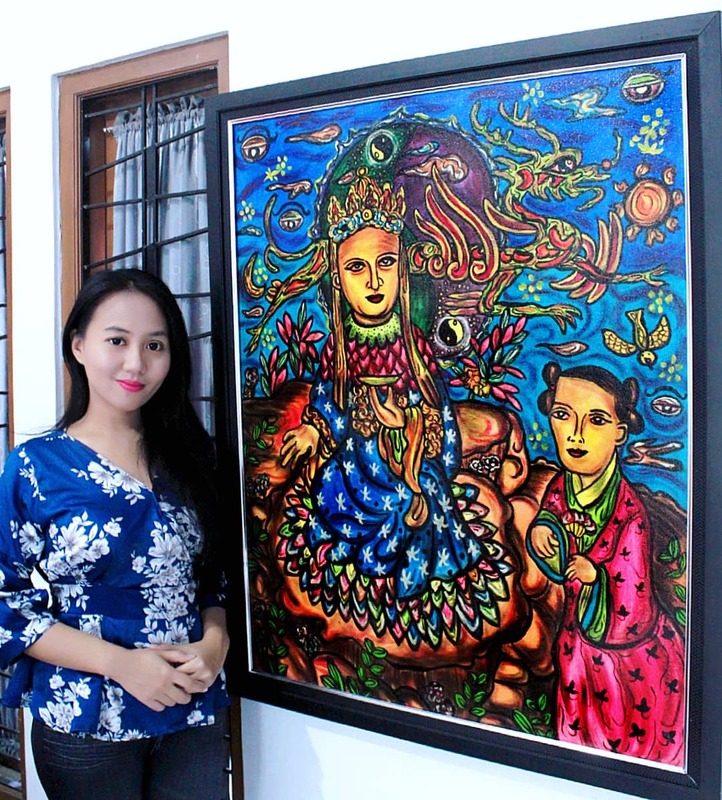 Two works titled Women F # 5 Pink Tears and Women F#6 Connivance were created in Indonesia when she was visiting Yogyakarta. In the series of Women F, summarized eight works titled Spring Fever, Do not be Afraid, Summer House, Ponds in the Forest, On the Carpet with Tiny Ducks, Pink Tears, Connivance, and Gaze. Thick eyebrows that characterize Frida Kahlo character are imposed on the face of the model to build a new character. It is an affirmation of the view that women are strong, independent and having unbeatable freedom. This is a maturation of culture that tends to push the perception that women should be gentle and pure. At last, my collaboration with Higi Jung will be a silent dialogue that will never end. From two different and far places we look toward a same point. Although the direction of our view is the same but our minds are wandering into the wilderness that much different. Indeed, a friendship becomes beautiful when each person is left to be himself to the fullest. 죽음은 인간을 괴롭히는 비극 중 하나일 것이다. 인간은 죽음을 강요당하기도 하고 때로는 선택하기도 한다. 하지만 죽음에 관한 명쾌한 해답을 알고 있는 사람은 얼마나 될까. 죽음은 인간이 영위하는 시간 상에 있어 영원한 자유를 의미한다. 몽테뉴 Montaigne, M. 는 ≪수상록 隨想錄≫에서 ‘죽음을 예측하는 것은 자유를 예측하는 일이다. 죽음의 깨달음은 온갖 예속과 구속에서 우리들을 해방시킨다.’고 적었다. 죽음은 모두에게 똑같이 주어진 운명이며 그것을 거스르는 인간은 없다. '우리는 어디에서 왔으며 어디로 가는가?' 라는 물음은 인류가 존재하는 한, 시대를 넘나들며 영원히 지속될 것이다. 이번 프로젝트를 함께 진행하는 세루니 보자와티(Seruni Bodjawati)는 ‘사람은 미스테리다.’라고 술회한다. 이는 모래의 티끌보다 작게 요약된 탄탄한 인간 정신에 관한 믿음을 기반으로 한다. 신체적 행동은 읽어 낼 수 있지만 영혼의 움직임이 어디로 가는지는 예측할 수 없다는 것이다. 그녀가 말하는 인간의 비극은 정신적 의미에서의 미스테리이며 그 의식의 흐름은 삶과 죽음 사이의 혼란으로 이어진다. 나와 세루니는 삶의 비극을 끌어안고 살아야만 했던 멕시코의 화가 프리다 칼로를 공통 분모로 작업을 하고 있다. 프리다칼로는 1907년 멕시코 시티 코요아칸에서 태어났다. FRIDA는 독일어로 자유를 뜻한다. 그녀의 이름 만큼이나 자유를 갈망했던 그녀는아이러니하게도 일생동안 죽음의 고비를 여러번 겪었고, 32번의 대수술을 받았다. 여기에는 선척적 자궁 기형과 사고로 인해 아이를 유산한 일도 포함된다. 운명적인 고통의 회오리를 몸에 품고 있었지만, 매번 그 위기의 순간에 절망하지 않고 늘 자신의 삶과 진솔하게 대면하며 삶을 탐구했다. “두 명의 프리다가 항상 싸우고 있었다. 하나는 죽은 프리다고 하나는 살아 있는 프리다였다.” 이승과 저승을 수시로 오갔던 그였기에 그녀의 그림에는 삶과 죽음의 면모가 담겨있다. 그녀는 피카소와 뒤샹 칸딘스키 등으로 인해 초현실주의자라고 인정을 받지만 정작 그녀 자신은 멕시코적 뿌리와 성향을 고집했다. 그는 다른 의도 없이 머리에 떠오르는 것을 그릴 뿐이라고 진술했다. 많은 작품 속에서 그녀는 피흘리고 상처받은 모습이다. 눈물을 흘리며 고통에 절망하고 있지만 두 눈은 투명하고 강인하다. 짙은 눈썹과 굳게 다문 입, 무표정한 표정으로 담담하게 서있는 인물들은 현실의 불행과 죽음 앞에서 더욱 빛을 발한다. 탄생, 결혼, 죽음은 프리다 칼로의 인생에서 가장 중요한 세 가지 사실이다. 1984년 멕시코 정부는 그녀의 그림을 국보로 지정했다. 세루니 보자와티(Seruni Bodjawati)는 1991년 9월 1일 인도네시아 족자카르타에서 스리 하르잔토 사히드(Sri Harjanto Sahid)와 와라 안인디아 (Wara Anindyah) 사이에서 태어났다. 그녀의 부모 모두 인도네시아의 화가이다. 어머니 와라 안인디아는 인도네시아의 프리다 칼로로 불리운다. 화가 집안에서 태어난 세루니는 생후 10개월이 되던 때부터 그림을 그리기 시작했고, 2009년에 ISI(Indonesia Institue of the Arts) 회화과에 입학하였다. 그녀는 국제적으로 다수의 그룹전에 참가하였고, 올 2012년에는 인도네시아 Kartini 잡지와 인도네시아 영부인 아니 유호요노(Ani Yudhoyono)가 수여하는 예술, 문화 부문의 인도네시아에 가장 큰 영감을 준 여성상을 받았으며 그 밖에도 많은 상을 받았다. 또 그녀는 페미니즘과 예술에 관련된 글을 쓰고 있다. 프리다칼로의 인생 전체는 세루니에게 무시무시한 영감으로 다가온다. 세루니는 15살 부터 우울한 운명을 가진 전염병 같은 프리다 칼로의 모습을 화폭에 담았다. 그녀는 이번 콜라보를 위해 7개의 작품 - <A Couple of Rebels / 200x145cm >, <Glimpses of Morning Star / 200x145cm >, <Children of Heaven / 200x145cm >, <The Legend Vanished in Memories / 200x145cm >, <The Silent World of Frida / 200x145cm >와 <Conquering the World / 200x300cm> 그리고 <Opera Pablo Pickahlo / 250x200cm>-를 선별했다. 세루니는 작품 안에서 회색빛 운명을 갖고 뒤틀린 죽음을 쥔 채 끊임없이 자신을 찾고 있는 프리다의 모습을 그렸다. 그는 스스로를 커다란 물음표를 짊어진 프리다로 투영하기도 했다. 그 모습은 마치 자유롭게 삶의 해답을 탐색하는 듯 보이지만 결국 해답을 얻지 못한채 현실과 직면한 듯 보인다. 그녀의 작업적 특징을 살펴본다면 첫 번째로 검은 테두리를 들 수 있다. 검정은 자유로운 감정의 흐름을 차단하는 색이다. 그것은 공포나 불안에 의해 생성된 자기의 억압을 반영하며, 심리적 위축 상태를 보여준다. 두껍게 칠해진 검정 테두리 안에 갇혀있는 오브제들은 그런 틀 안에 갇혀 그 속에서만 맴돌고 있는 것이다. 이 검정은 고전적인 무게감을 더해 주기도 한다. 또한 무채색과 원색의 조화는 환상적이지만 고통스럽고 불행한 아우라를 풍긴다. 그녀의 그림에는 여백이 없다. 실제로 그림의 배경에는 괴기한 표정을 띈 형상들이 드라마틱하게 화면 가득 채워져있다. 마치 빼곡히 들어찬 요소들이 화폭 밖으로 쏟아져 내릴 것 만 같다. 실제로 그녀의 작품 앞에 서있으면 현실의 무대 앞에 서있는 느낌이다. 삶이 무수한 사건들로 연결된 하나의 거대한 덩어리로 보여진다. 그것은 사람의 키를 압도하는 캔버스의 크기는 때문이기도 하다. 그 크기는 화폭에 담긴 삶을 강요 하는 듯 느껴진다. 피사체의 표정, 색, 크기, 구성등은 초현실적인 분위기를 자아낸다. 그녀는 인간 본질에 관한 대범한 물음을 던진다. 삶은 절대로 답을 내릴 수 없는 미스테리이며 그 삶을 살아가는 인간 또한 거대한 물음표로 남아있다. 프리다는 일생 동안 55점의 셀프 포트레이트를 그렸는데 그 이유는 자신이 가장 잘 아는 소재였기 때문이다. 아마 그림을 통해 자신을 존재를 증명하려 했던 것 같다. 나 또한 비슷한 맥락에서 2009년 Women F 시리즈의 첫 시작을 셀프 포트레이트로 촬영하였다. 사진 <#0 Do not Afraid> 와 <#1 Spring Fever>가 셀프 포트레이트이다. 나는 현재까지 총 8점의 작품을 만들었고 거기에는 나를 포함하여 총 3명의 모델이 있다. #으로 시작되는 번호는 작업 순서의 분류를 위해 붙여졌다. 삶은 모두 각기 다른 단면을 가지고 있기에 각 #들을 어디에 갖다 놓아도 그것 본연의 이야기로 구성된다고 생각한다. 따라서 번호에 따른 이야기의 맥락은 크게 존재 하지 않는다. Women F의 F는 여성, 그리고 자유를 상징하는 열린 문자이다. 당시 나는 스스로를 불행하게 만들고 있었다. 꿈을 모르는 나에게 미래는 부정적이었고 늘 나 자신에게 불안함을 느끼고 있었다. 마치 미래가 나를 강탈한 기분이었다. 물음표로 가득찬 삶에 대한 해답이 필요했다. 그러기 위해서는 나 자신을 발견해야했다. 때늦은 정체성 찾기에 혈안이 된 나는 위장을 하듯 프리다 칼로의 짙고 두꺼운 눈썹을 그려넣었다. 그것은 마치 부적처럼 어떤 힘이 생기는 듯 했다. 늘 죽음과 동행하며 불안한 삶 속에서도 자신의 목소리를 잃지 않았던 프리다 칼로의 영적인 힘을 갖고 싶었던 것이다. 그녀는 자신을 죽음과도 맞바꿀 정도로 사랑했던 사람이었다. 그녀로 인해 내 삶의 결여된 부분이 강인한 에너지로 채워질 것만 같았다. 그후 다른 여성들에게도 프리다칼로의 눈썹을 그려 넣으면 어떤 에너지가 생겨날지 궁금했다. 때문에 작업에 참여하는 모델들이 갖고 있는 이미지는 중요한 영감이 되었다. 작업에 참여한 김재화와 다라자티 페르티위(Darajati Pertiwi)는 현실을 비관하거나 낙담하지 않고 삶을 능동적으로 개척하며 자신의 역할에 충실한 사람들이다. 그들의 이러한 면모가 외모에서도 묘한 강인함으로 나타났다. 작업을 하는 동안 모델의 시선에서는 완강하고 확고한 눈빛이 묻어났다. <#2 Summer House – 그녀는 데킬라 한잔을 마시고 그동안 돌보지 못했던 화분에 물을 줬다>, <#3 Ponds in the forest – 그녀는 물과 함께 울고 있었다>, <#4 On the carpet with tiny ducks>, <#7 Gaze>는 김재화와 함께 했고, <#5 Pink Tears>와 <#6 Connivance>는 Darajati와 인도네시아 족자카르타에서 촬영을 했다. 각기 다른 배경으로 촬영된 이미지들은 각기 다른, 시간과 이야기를 담고 있지만 그것들이 한데 모이면 Women F로 대변되는 여성들의 이야기로 발전 된다. 이 작업에 담길 인물과 이야기들은 다양하겠지만 결국 자유를 갈망하는 인간의 강인한 에너지로 채워질 것이다. 그것은 프리다 칼로라는 형상이 아닌, 그 인물이 가지고 있는 본질만이 남을 것이다. 프리다 칼로는 사랑과 고통을 부둥켜 안고 죽음과 직면하며 살아가야만 했던 자유를 갈망하던 한 인간이다. 평생 그 해답을 알 수 없는 삶과 죽음이라는 아이러니에서 자신의 존재를 규명하고 있는 것이다. 삶의 불안정하고 모호한 물음표에 해답을 찾기 위한 나와 세루니의 작업의 행로는 변하지 않을 것이다. Death will be one of tragedies that bother humans. Sometime, humans get forced to die or choose to die. But, how many people in the world would have exact answers to death. The death means eternal freedom in time that humans are alive. Montaigne, M said from <<Les Essais>> that anticipating death is anticipating freedom. He wrote that Understanding death allows us to be free from subordination and imprisonment. The death is destination that is given to all of us, and no one can go against it. The question “where has we come from and where are we going to?” will last over generations and generations as long as human exists. Seruni Bodjawati who works on the project with me says that “human is mystery.” This saying is on the basis of a belief about human mentality that is compressed as tiny as a speck of dust. While we can read physical human actions, we cannot anticipate where movements of soul go. According to her, tragedy of human is mystery in a mental context and flow of the consciousness links to confusion between live and death. Seruni and I are working for the project on the basis of Frida Kahlo who had to live a life embracing a tragedy. Frida Kahlo was born in Coyoacan, Mexico in 1907. Frida means freedom in German. Frida who was eager for freedom just like her name ironically had gone through lots of moments of death in her life and underwent 32 times of surgeries. These tragedies include a congenital uterine anomaly and miscarriage. She was incubating all the pains of destiny, but she had never despaired at the moment of the crisis and even more, she always sincerely faced her life. “Two of Frida were always fighting. One was dead Frida and the other was alive Frida.”. She came back and forth from the life to the death, so there are two sides of life and death in her paintings. She was acknowledged as a surrealist from Picasso, Duchamp and Kandinsky, but she had stuck to her a Mexican root and inclination. She mentioned that she only draws things that came across her mind without any other meaning. She was bleeding and deeply wounded in many of her works. While she was crying and despairing in pain, her eyes were clear and strong. Figures in her works, who calmly stand with their dark eyebrows, stubbornly closed mouth and poker faces, seem shinier in front of their misfortune and death. Birth, Marriage and death are the most important three facts in Frida Kahlo’s life. In 1984, Mexican government designated her painting as a national treasure. Seruni Bodjawati was conceived from Sri harjanto Sahid and Wara Anindya in Sri Harjanto Sahid, Indonesia in September, 1st in 1991. 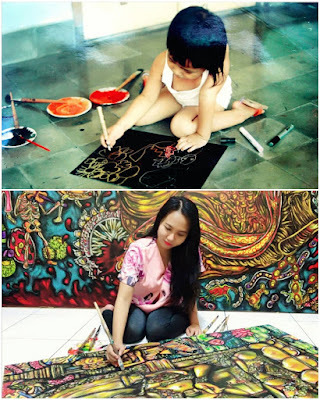 Both her parents are painters in Indonesia. 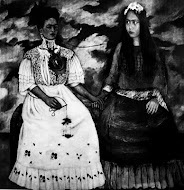 Her mother, Wara Anindya is considered the Indonesian Frida Kahlo. 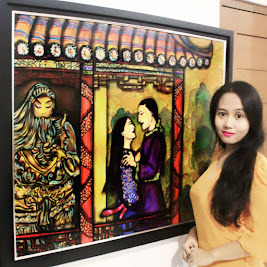 Seruni, who was born into a painter’s family, started drawing when she was a 10 month old baby and has gotten accepted into ISI(Indonesia Institute of the Arts) in 2009. 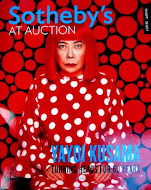 She has participated in lots of international group exhibits and received an award as the most inspiring woman in Arts & Culture field from the frist lady, Ani Yudohoyono and Indonesian magazine, Kartini in this year, 2012. Also, she writes regarding feminism and arts. Frida Kahlo’s whole life has come to Seruni as a tremendous inspiration. Seruni has been putting Frida Kahlo who had a depressing life into her canvas. She has chosen seven works for this collaboration: They include < A Pair of Rebels 200x145cm >, <Glimpses of Morning Star / 200x145cm >, <Children of Heaven / 200x145cm >, <The Legend Vanished in Memories / 200x145cm>, <The Silent World of Frida / 200x145cm >and <Conquering the World /200x300cm> and <Opera Pablo Pickahlo / 250x200cm>. Seruni has drawn Frida in a way that is continuously looking for herself: grabbing her twisted death with a darkened destiny. Sometimes, she projected Frida who carries a big questions mark onto herself. That seems to be looking for answers to life with freedom, but eventually seems to face the reality of the life without getting the answers. One of features of her styles in her works is black outline. The black is a color that blocks a flow of unconstrained emotions. That reflects self-suppressions generated by fear or anxiety and shows psychological withdrawals. The objects that are locked within the tick and black outlines are only circulating inside the frames. This black also adds classic heaviness onto the paintings. Additionally, combination of achromatic colors and primary colors is fantastic but exudes painful and unfortunate aura. There is no blank space in her paintings. In fact, the backgrounds of her paintings are dramatically full of the figures with grotesque faces. The objects jammed in the paintings seem to fall out of them. When actually standing in front of her works, I feels like standing in front of a real life. The lives look like a massive chunk that is liked by myriad incidents. That is also because of the size of the canvases that are big enough to overwhelm our heights. The big size seems to emphasize the lives in the paintings. The subjects’ facial expression, colors, size, and formations create surrealistic atmosphere. She casts a bold question on the nature of human beings. The life is a mystery that can never give us an answer. Humans who also live that life are left as a big question. Frida had drawn 55 pieces of self-portrait paintings, because herself was the subject that Frida knows the most well. Maybe, she was trying to prove her existence through her paintings. On the similar side, I took a photograph of self-portrait, <Woman F, 2009> as a start. Photos, <#0 Do not Afraid> and <#1 Spring Fever> are self-portraits. I have made 8 pieces of works including three models and myself. Numbers following by # means the chronological order of the works created. All of the lives have different aspects; therefore whether these #s are attached to any of work pieces, they will play each own role creating their own stories. So, the contexts of stories related to the # numbers do not really exist. Alphabet F in <Women F> is acronym for Female, also an open letter standing for freedom. At that time creating my first work, I was making myself unhappy. To me who doesn’t have a dream, the future was always something pessimistic and I was feeling unstable about myself. I felt that the future was robbing me. I needed answers to my life that is full of questions. To do so, I had to find myself first. I was desperately searching for my identity and drew Frida Kahlo’s thick and dark eyebrows on my face as if I disguised as her. It seemed to give me some power like lucky charms. I wanted to have Frida Kahlo’s spiritual power, who didn’t lose her voice in midst of her unstable life that constantly companies death. She loved herself so much that she could even exchange her life with death. I felt that part of my life that is lacking could be filled with strong energy thanks to her. Then after, I started wondering what energy will strike if I draw Frida’s eyebrows on other girls’ faces. Therefore, the models’ images have become very important inspiration. Kim, Jaehwa and Pertiwi, Derajati who were models for my project actively pioneer their life being devoted to their own lives instead of being pessimistic or discourage about their lives. Their these aspects appeared as tenacity on their faces. While working on the project, the models’ eyes were tenacious and firm. <#2 Summer House – She had a shot of tequila and watered the flowers that she couldn’t take care of>, <#3 Ponds in the forest – She was crying with the water>, <#4 On the carpet with tiny ducks>, <#7 Gaze> was worked with Kim, Jaehwa and <#5 Pink Tears> and <#6 Connivance> were shot with Darajati in Yogyakarta, Indonesia. While the images shot in different places respectably contain their own different times and stories, when they get all together, they become developed to women’s stories, who represent Women F. Models and stories in this project will be various, but will be filled with humans’ strong energy that is eager for freedom. If I am asked what will be left in our project discarding all of the components in our works, that will be Frida Kahlo’s essence not her figuration. Frida Kahlo was a human who had to live her life embracing love and pain and facing death at the same time being long for freedom. She was tracing her existence in the middle of irony between life and death whose answers cannot be aware of. Seruni’s and my path of works to find the answers to questions of unstable and ambiguous lives won’t be changed.